Isn’t it time we changed the dialogue around millennials and money? Moved away from berating them for their supposed avocado-eating, latte-sipping, globe-trotting habits and offered some pragmatic strategies for building a sustainable financial future? We certainly think so. It’s why we’ve broken down 5 investing tips for millennials looking for an alternative to sacrificing brunch. It all starts with you. You need to arm yourself with as much knowledge as possible. This will build your confidence and a well-oiled jargon detector. Knowledge is the suit of armour protecting you from property spruikers and public figures that think you should get a higher paying job or live out in the country. While continual learning is very much a lifelong process, we know it can be daunting to get started given how opaque and downright confusing anything to do with finance can be. However, millennials have technology on their side with almost every industry being shaken up to be democratized in some way – financial services is no exception. Pocketbook: helps you get on top of your finances, manage your personal spending and saving goals for free. Carrots: are on a mission to “make it as easy + as joyful as humanly possible for *anybody* to be on top of their money.” There’s also a Facebook chatbot on the way. Finch: is a financial app for your social life geared at millennials who want to make finance fun. The one, crucial advantage millennials have over their predecessors is the luxury of time. While everyone can weigh up the risks and rewards of investing, you’re particularly well-placed to reap the benefits of time in your 20s compared to later down the track. A longer investing timeline means you can focus on building long-term wealth via capital growth, rather than being solely focused on the regular income a stock can provide (typical amongst retirees/boomers). If you’re keen to gain exposure to the world’s leading tech companies (Amazon, Facebook, Google), the income option isn’t even on the table – they don’t pay dividends as they’re fixated on growing their capital value instead. If a company routinely pays out most of its profit to you as income (dividends), what’s left to reinvest for continual revenue growth? What your time effectively ‘buys’ you is the opportunity to take full advantage of investment compounding. Albert Einstein dubbed it as the “eighth wonder of the world” and one of the most successful investors of our time, Warren Buffet, credits much of his success to this simple principle. Compounding is an almost magical concept whereby your interest earns more interest, or you make returns on the returns already earned over time. 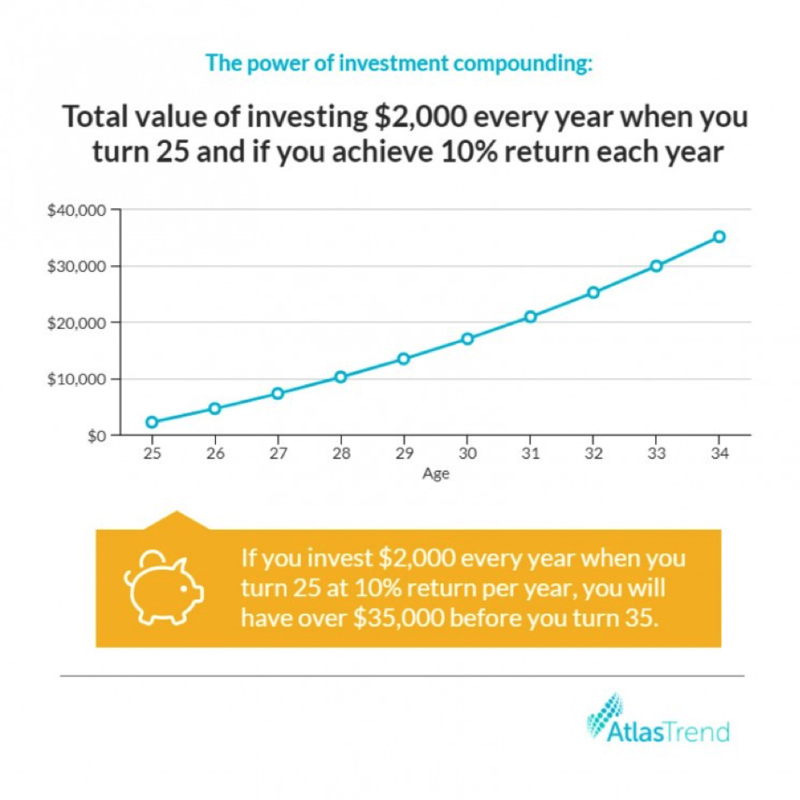 The hypothetical example above shows that by investing $2,000 every year when you turn 25 and achieving a 10% return per year, you’ll have over $35,000 before you turn 35 years old. Investment returns vary and can’t be guaranteed but you can see the power of investment compounding. It’s fair to say many millennials have been priced out of the property market; a reality that isn’t likely to change if you decide to forgo the smashed avo on toast (even if you hold the feta). We won’t get into the average house price in most capital cities, or just how far our lending culture has taken us (household debt is close to 190% of disposal incomes), as it’s not so uplifting. What’s important to understand is just because the generation before you bought a one-way ticket to wealth via property, doesn’t mean it remains the panacea for building wealth as a millennial. Don’t let the ‘23-year-old builds million-dollar property portfolio’ headlines dishearten you, there’s nothing glamorous about going into mounds of debt without truly understanding the risks such stories tend to leave out. If you’re still unsure about property as an investment, try comparing it to something like shares – specifically shares in companies you already know and love, like Amazon or Facebook. You level the playing field by comparing things you’re familiar with but also learn a thing or two about which one makes more sense to you. If your gaze is firmly glued on the horizon, you’ll be less phased by the ebb and flow of the stock market – viewing inevitable declines as an opportunity instead. Markets change daily – they go up, they go down and sometimes a tweet from Donald Trump can cause an innovative company’s shares to plummet (Amazon, Toyota, Boeing). Reacting based on daily occurrences is not a sound long-term investment strategy, and it’s better to look at yearly or even multi-year figures for a more accurate reflection of performance. Many smart, seasoned investors are hanging out for these periods of negativity, as it signals they can invest in top companies for a lower price. As bizarre as it may sound, stashing money in a mattress carries a level of risk to consider. While it’s very low, you can’t guarantee it won’t be stolen. When you invest in a bank savings account the interest may be so low that you lose money through inflation. The apparent security of the above money storing methods, does mean you might not suffer the losses you would experience in other investing streams (property value declines, share price drops) but you do miss out on the opportunity to make decent returns. The moral here is not to be alarmist about where you put your money, but to reiterate nothing comes without some risk. Embracing risk to a degree is critical to producing higher range long-term investment returns. This is the risk-return relationship. You will find plenty of conflicting evidence and opinions in your quest for quality investing information. It can be overwhelming and difficult to ascertain right from wrong. Although taking in a multitude of sources can be beneficial for maintaining a well-rounded view, when it comes to investing you only have to ask yourself a set of simple questions to fully grasp the impact of a particular event. Let’s stick with the Trump theme and suppose the President tweets something like: “Google doesn’t know what they’re doing. Don’t get search results I want. Sad!”. Will those comments affect Google’s ability to deliver on profit expectations/forecasts? If the answer is no, it’s just noise. If you pay attention to the real factors influencing a company’s share price and future growth (starting with the questions above), you’ll easily block out any irrelevant information. Well delivered information. Thank you. I would suggest that investing in income producing shares with fully franked dividends and reinvesting the income will produce as good a long term result as hoping for capital gain.